Now we live in the world of the New Testament. It is different with the Old Testament. Way back then before Jesus Christ came on earth to redeem us, mankind must offer sacrifices for a period of time so that their sins can be forgiven, but only until a certain period of time. After the period is over, mankind must offer sacrifices again. Sacrifices here can be a sheep, a cattle, a bird, etc. The sins mankind have committed would determine the size of the living sacrifice. The heavier the sin is, the bigger or the more expensive the sacrifice would be. However, Jesus Christ has come to the world and He became the Living Sacrifice. The difference is that this type of sacrifice is only once for all, which means that our sins are being forgiven for ever. The Lord has forgiven all our sins because Jesus has taken our place up there at the cross. It should be us back then at the cross. But Jesus replaced us and became a Living Sacrifice for the Lord. The blood of Jesus has sanctified us forever. However, a lot of people only remember about the blood, but not about the Water. The Blood came out first, then the Water came along. The key to everything that I’m talking about is in this Water. To understand about this, let us read first. From verse 7, Jesus said that what He did at that time the disciples will know about it later on. This means that what Jesus did here was symbolic, and therefore, have meanings. From these verses, let us focus on some words such as “laid aside His garments”, “towel with which He was girded”, “poured water into a basin and began to wash the disciples’ feet”, and “wipe them with the towel”. He laid aside His garments as a symbol that Jesus arose from the dead. in this context, Jesus rose from supper in the Passover feast, and in every table at the Passover feast, there will always be a roasted lamb. This lamb represented Jesus when He was burned by the wrath of God at the Cross because Jesus has replaced us at the cross. And when He laid His garments, it means that He will rose from the dead. The towel girded to Him means that Jesus is the High Priest, and He came to this world to minister. 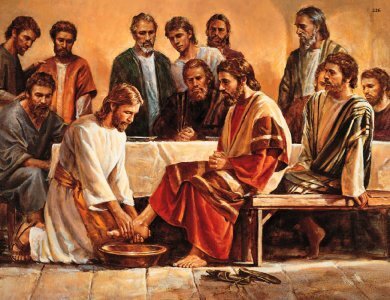 He poured water and washed the disciples’ feet with it means that we all will be cleaned again and again, but not with blood anymore because blood of Jesus has sanctified us forever. But by Water. Water by the Word. So people, we need to be cleansed not by blood anymore because blood of Jesus has cleansed us once and for all, but by the Word of God. By the Water. Don’t forget to read your Bible everyday because this will cleanse your feet. We need not to clean our whole body with Water because we have been bathed by the Blood of Jesus and we are clean forever. But our journey in life will involve our feet, and sometimes dust and dirt may come to stick at our feet. This represents all our mistakes we may have committed in this life. But believe that we have been cleansed by the blood of Jesus forever and He has forgiven all our sins and mistakes. Do not be tricked by the devil. Devil may tricked you and condemned you for your mistakes. That’s why you need to be strengthened by the Word of God. By the Water. And after Jesus washed the disciples’ feet, He wipe the feet with the towel. Just imagine if our feet were wet and we walk outside again. There will be more dirt and dust on our feet. This means that after we receive or hear His Word through this Bible for example, we must realize the truth that we have been forgiven through the sacrifice of Lord Jesus once and for all! We must also realize that our lives cannot be apart from the Word of God. Everyday we need His Word.